For 2015, the all new V-Strom 650 XT ABS is here to expand your field in adventure touring. Equipped with the improved performance of the original V-Strom 650 ABS and the accessories of the V-Strom 650 ABS Adventure, the new V-Strom 650 XT ABS has more adventurous styling with a new distinctive front beak with integrated air ducts that lead air to the wind directing plates for improved cooling performance and aluminum reverse spoke wheels for better shock absorption and a comfortable ride. The wide range of accessories included are an adjustable windscreen, newly designed sleek aluminum side cases, and a rugged accessory engine bar that make it comfortable and versatile. The 645cc V-Twin engine with exceptional low-to-mid rpm performance combined with striking accessories and unique styling, conveys an adventurous spirit. Digital Antilock Brake System (ABS)* unit features a lightweight, compact design. The ABS monitors wheel speed, and matches stopping power to available traction. 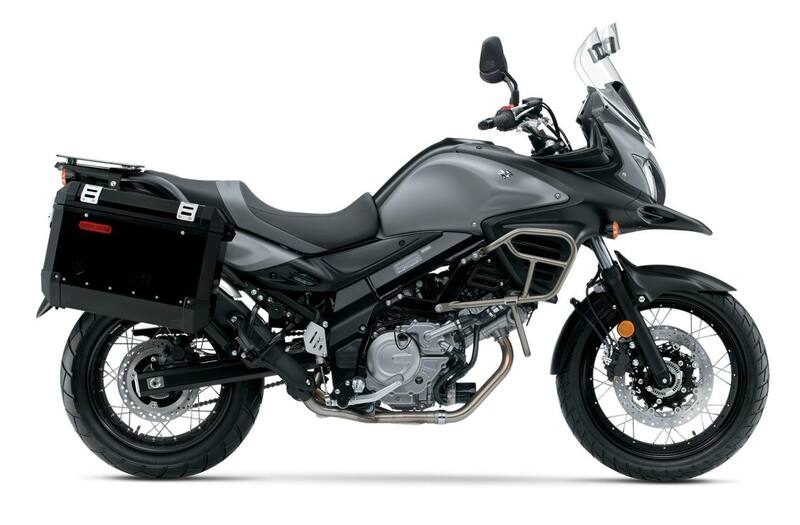 The V-Strom 650XT ABS expands its versatility with spoke-wheel rims, a wider range of accessories, and more adventurous styling. 5-way spring-preload-adjustable 43mm-stanchion-tube front forks and link-type rear suspension with rebound stepless damping adjuster as well as a spring preload adjuster that can be increased or decreased by turning a knob, without using tools. Newly designed and distinctive beak on the front inspired by Suzuki heritage along with narrow and compact bodywork designed for long range comfort. The beak has intake ducts which lead air to the radiator. With a comfortable, upright riding position and a low seat height, the functional seat combines red-stitched leather-look sections and suede-look, slip-resistant surfaces, and is topped off with an embossed V-Strom logo. Informative, multi-function instrumentation includes an analog tachometer and brightness-adjustable LCD speedometer. LCD readouts include odometer, dual trip meter, gear position, coolant and ambient temperature, average fuel consumption, fuel gauge and clock. Switching between LCD readings can be done with the left handlebar switch.